Boston can claim its new tunnel project as the "big dig", but the nearly $3 billion effort to dredge navigation channels in and around New York to 45 — and eventually 50 ft. — is the second largest USACE project; ever. - by Greg Trauthwein The initial thought while standing in the working cockpit of the world's largest backhoe dredge is: "how does this thing not simply snap off and fall in?" However, with each 13-yd. bucket scoop of the bottom of Kill van Kull breaking above the water's surface and being unceremoniously dumped into an awaiting 4.000 yard scow — a process that takes all of 60 seconds — one quickly appreciates the engineering genius behind the behemoth from Liebherr, the entire vessel in fact, as it steadily works to deepen the navigation channel for the growing fleet of very large, very deep draft containerships that call on the ports ot New York/New Jersey. Maritime Reporter recently ventured out into the harbor with the U.S. Army Corps of Engineering - New York District, hosted by Colonel John O'Dowd, District Engineer, to view first-hand the gargantuan task of digging the navigation channels to 50 ft. The effort is necessary to accommodate the growing number of very large containerships that come calling on the port. Simply put, the dig is essential for the port's long-term survival. While local tug operators may not be pleased with the effort, equating deeper draft ships to fewer ships entering port and hence fewer billing opportunities, if the big ships do not find NY accommodating their needs, they will simply go elsewhere. According to the American Association of Port Authorities, in 2002 New York/New Jersey ranked number three in North American in total TEU moved and is enjoying a healthy growth, with a total of 3,749,014 boxes, up 432,739 boxes (13%) from 2001. (See chart p. 28). 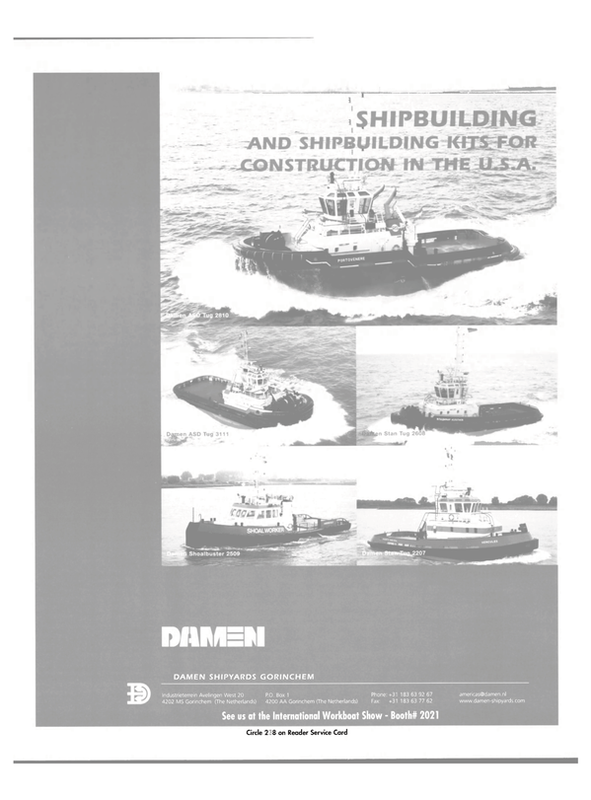 As the USACE — NY District's quarterly newsletter quite accurately states, history is being made right now in the Port of New York and New Jersey, as currently there are approximately 80 pieces of dredgingrelated equipment in the harbor, including dredges, drill boats, survey boats, tugs and scows - arguably the largest concentration of equipment in one area in the entire 200-year history of the U.S.
Army Corps of Engineers. Included in this mix is the backhoe dredge New York, the aforementioned largest backhoe dredge in the world. New York, New York The New York District is responsible for the Corps' water resource development. navigation, and regulatory activities in northeastern New Jersey, eastern and south-central New York State, including New York Harbor and Long Island, and parts of Vermont, Massachusetts, and Connecticut. In a nutshell. Colonel O'Dowd. who assumed command of the New York District of the U.S. Army Corps of Engineers in July 2001. is responsible for about 240 miles of Federal channels. Col. O'Dowd — who also holds the title of Supervisor of New York Harbor - annually oversees the awarding of approximately a half billion dollars in contracts for the district. Dredge New York was specifically built in 1999 for the j ob it is now performing, stationed in Contract Zone 5 (see map of area), a critical two mile-long by 800 ft. wide span that is scheduled for completion in the Spring of 2004. To the layman, accurately ascertaining exact dredging depth may seem more art than science. But according to Christopher G.
Gunsten, project manager for Great Lakes Dredge & Dock Company, the advent of multi-beam bathymetry allows the operator and the Corps of Engineers to know the exact depth at any point on a given channel. "We have to come to within a tenth of a foot ... so if they tell us to dredge to 52 ft., and it is only 51 ft., nine inches, we have to go back out and complete the job." said Gunsten. Dredging in New York is far from a straight-forward process, as there are myriad logistical and environmental considerations, conditions which change with each of the dredge contract areas. Adding to the challenge: while the work goes on. the navigation channel must be kept open to normal commercial traffic, a feat which requires close cooperation with the U.S. Coast Guard as well as the other area marine authorities. The navigation channels in and around New York/New Jersey actually bear strong resemblance to its population: a massive quantity, but hardly homogenous. As Col. O'Dowd explained, digging out the area is a challenge on many fronts, not least of which is the wide variety of material to be dug: from sandstone and shale to Diabase rock, which is granitelike in appearance. Dredge New York can handle up to a 28-yd. bucket, but given the consistency of material in its present position, the 13-yd. size was deemed the most efficient for the task. Working 18 to 20 hours per day with a rotating crew of 40, Dredge New York is the largest and most efficient of the lot. utilizing the latest software which gives the operator a crystal clear picture of the bucket, allowing them to know its position within six inches at all times. The Project Many pieces of equipment are working to deepen the three active contract areas in the Kill van Kull to 45 ft., which stretches eight miles from Upper New York Bay into Newark Bay. Eventually, using a creative "piggyback" contract by Colonel John B. O'Dowd, District Engineer Christopher G. Gunsten. Project Manager, Great Lakes Dredge & Dock Co.
budget. The first phase of this project began in the mid 1980s and deepened the KvK to 40 ft.. Now. because of the demand of the larger vessels calling at the port, contractors have been working to construct a 50-ft. channel in certain areas. Post-Panamax vessels, which to the outside eye can appear no different from 10 years ago. actually will carry 8.000 containers, compared to 3,000 typically loaded on today's Panamax ships. The Kill van Kull is one of the most heavily trafficked channels in the port, where dredging, drilling and blasting occurs daily. Circle 301 on Reader Service Card the Port Authority of New York and New Jersey, a portion of the KvK channel will be the first completed 50-ft.
Years before the mobilization of the first dredge, before the first project area was awarded to a contractor, the KvK team worked together to produce a Project Management Plan during the planning and design phase. Now, the Project Delivery Team has executed an aggressive, accelerated schedule, which by 2004 will complete the deepening project ahead of schedule and under budget. The first phase of this project began in the mid 1980s and deepened the KvK to 40 ft.. Now. because of the demand of the larger vessels calling at the port, contractors have been working to construct a 50-ft. channel in certain areas. Post-Panamax vessels, which to the outside eye can appear no different from 10 years ago. actually will carry 8.000 containers, compared to 3,000 typically loaded on today's Panamax ships. The Kill van Kull is one of the most heavily trafficked channels in the port, where dredging, drilling and blasting occurs daily.